Alabama winery and bar enlists expertise of industry leading commercial furniture manufacturer to supply commercial bar stools. 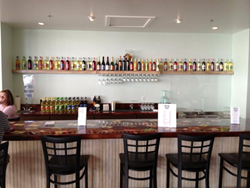 Winery, bar and retailer Paradise Fruit Wine & Accessories recently enlisted the help of Restaurant Furniture Supply to supply them with new commercial bar stools for the grand opening of their new bar in Orange Beach, Alabama. Located in the Wharf Complex on Canal Road in Orange Beach, Paradise Fruit Wine makes premium specialty tropical, berry and citrus wines. Their store is an independent retailer associated with the Florida Orange Groves Winery. All of their premium specialty tropical, berry and citrus wines are made 100% from the juice indicated on the label. They have 31 wines, 5 champagnes, 3 ports and 1 cream sherry. Everything they sell is available for tasting. They also make Tortuga Caribbean Rum Cakes and wine smoothie. They also carry a wide range of wine accessories and carry traditional wine from around the world. Paradise Fruit Wines and Accessories celebrated the grand opening of their wine bar and retail store recently. "The owner turned to Restaurant Furniture Supply for commercial chairs because of their reputation for excellent quality at affordable prices" explained sales person Chris K. "He opted to go with the elegant Window Back Metal Bar Stool with a black frame finish and solid wood mahogany seats. It's one of our most popular bar stools. As a business that gets a lot of traffic, he needed a bar stool that they knew would be durable and stand up to heavy usage without getting wobbly or breaking, like a bar stool not constructed for commercial use would tend to do," Chris K. said. Restaurant Furniture Supply's Window Metal Bar Stool is currently on sale for $54. Customers can choose a solid wood seat or a padded seat made of high density foam. The padded seat is made in the USA and comes in vinyl or fabric in many different colors. A custom seat can also be upholstered in any material for an extra cost. The wood seat comes in cherry, dark mahogany, walnut, natural and black finishes. A custom finish can also be made. The frame comes in black, gold, copper vein, silver vein or gold vein. A matching Window Back Metal Chair is also available and is on sale for $36. Browse Restaurant Furniture Supply's full selection of commercial grade chairs, bar stools, table tops, table bases, booths and patio furniture at http://www.restaurantfurnituresupply.com/ or talk to a customer service representative at (888) 346-9992. Paradise Fruit Wines and Accessories is located at 4790 Wharf Parkway in Orange Beach, AL. They can be contacted at: (251) 923-0060.